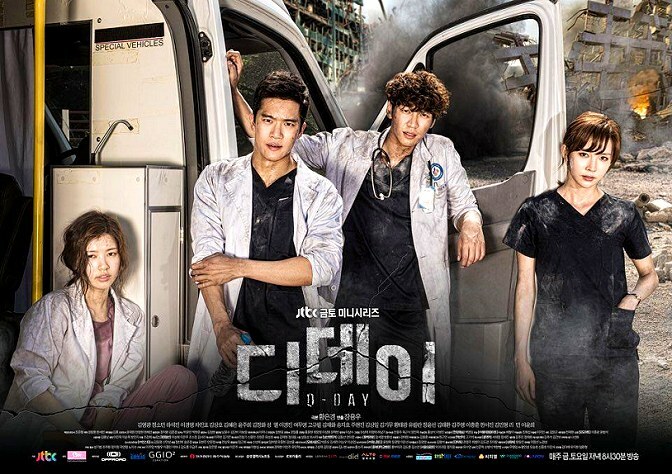 I thought the premise of this show, D-Day (2015) would be intriguing, showing what would happen to Seoul, South Korea, if an unexpected earthquake of 6.5 on the Richter scale would hit the city. Seoul's buildings are only built to withstand a 4.0 on the Richter scale: there would be massive devastation if one were to hit much higher than that. The first few episodes had me on the edge of my seat, especially episode 3 when the disaster struck. 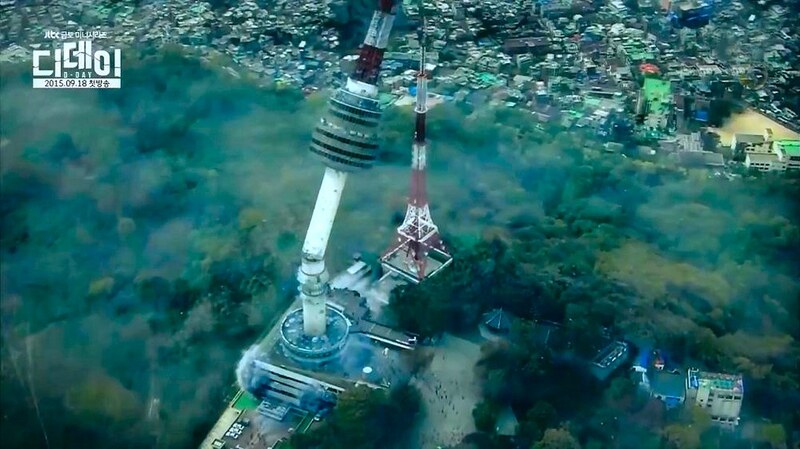 This small pay cable station jtbc must have spent a FORTUNE on special effects to show the horror of what would happen during such a disaster, to buildings, subways and other transportation, bridges, electrical grids, communication towers, etc. It truly was frightening, there was nowhere to go where anyone could be safe -- you just had to pray! And as it is often the case with natural disasters infringing on man's peace and security, the disaster does not end when the buildings stop collapsing and the ground stops shaking and cracking. People do not think clearly, they act in irrational fear and often put their lives and that of their fellow man into more danger in the aftermath. The focus on D-Day is basically on one group of doctors, split between two different hospitals, and when one hospital collapses because it's a very old building devoted to caring for the poor that leaves only one hospital available for the masses of people who suddenly need medical care, even life-saving surgery. The catch? This surviving hospital was a private hospital that only catered to rich folks with insurance and money. How does one small group of doctors and nurses suddenly handle literally thousands of patients all in distress? Will the private rich hospital even want to care for any of them? What about medical supplies for even the most basic things, like cuts and bruises? 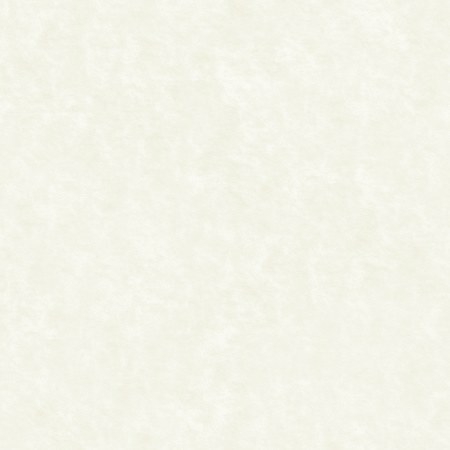 Or what happens to wounded people when antiseptics run out and there's no way to fight infections? What happens to diabetic people who can't get any more medications? Our doctors and other medical people have their lives turned upside down in one hour, similar to how Americans must have felt on 9/11. .
All of these actors were fabulous and they were the ones who kept me coming back to watch through all twenty episodes. I grew to care about these characters so much. I do feel that as it wound down the script could have been better, given them more focus and more reason for hope, but I could tell that everyone in the cast was literally EXHAUSTED by the end of this drama. It wasn't just makeup, they looked wiped out physically and emotionally. They should all get awards for pure stamina alone! Also, after a few episodes, we start to see more of a search and rescue team as well, and their lives dedicated to service first, their own needs second. Very inspiring. 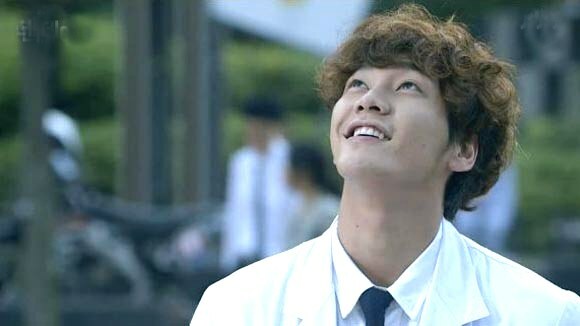 Dr. Lee Hae Sung (Kim Young Kwang from Pinocchio in a masterfully brilliant performance filled with complexity) is a surgeon at a charity hospital whose moral compass is strongly influenced by his devotion to his comatose mother. His character bears similarity to Dr. Kim Tae Hyun (Joo Won) of Yong Pal, in that he is willing to go to any lengths to aid patients in need, even if it means risking his own life. In his personal life he has a rather fractious relationship with his younger brother Lee Woo Sung (Song Ji Ho) a fire and rescue worker who blames Hae Sung for not being able to save their mother from falling into a vegetative state. Hae Sung meets up with a pretty female intern doctor from Busan, Jung Ddol Mi (Jung So Min from Bad Guy and Playful Kiss), who perks his interest and just when they are getting to know each other a bit and to start to trust one another, a major disaster hits Seoul, a 6.5 on the Richter scale earthquake that destroys buildings and practically all infrastructure in the city. They are thrown together for real now, and their first medical job is to save a pregnant woman trapped in a car who is about to give birth to twins! Even babies can't wait for disasters to end before coming into this world! Hundreds of people start to show up at the charity hospital where Hae Sung works and where his comatose mother is a long term patient. After he assists in the birth of the babies both Jae Sung and Ddol Mi have to convince everyone to leave the hospital because they see the walls starting to crack inside and they sense this old building won't last much longer. Hae Sung and Ddol Mi create makeshift incubators for the twins, put the mother in a wheelchair, put his own mother in a wheelchair, and off they go to try and find another hospital that will take them. Two male patients are not trusting this situation and run back inside the crumbling hospital, with Hae Sung chasing after them, but almost as soon as the men enter the building it starts to collapse and they are trapped inside. Horrified, Hae Sung tries to rescue them, he can hear someone crying out inside and he starts crying himself because he can't reach them. This moment will continue to haunt him for a long time afterward. Eventually he has no other choice but to return to the living patients who need him. The group end up at the pier and someone volunteers to run a ferry for them all so they can find another hospital without having to walk all the way. As they are able to relax for a brief time on the ship they are soon horrified to see the disaster that has fallen Seoul, with bridges cut in half and even the famous Namsen Tower destroyed. Everyone ends up at the rich private hospital called Mirae Hospital, and Hae Sung implores the difficult to deal with Director Park Gun (veteran actor Lee Kyoung Young) to accept the triaged victim patients he has rescued. Director Park capitulates after a fight, but only because he realizes that Hae Sung has a VIP patient with him who is clinging to life and it will be good eventually for publicity for his hospital if he treats this man well. 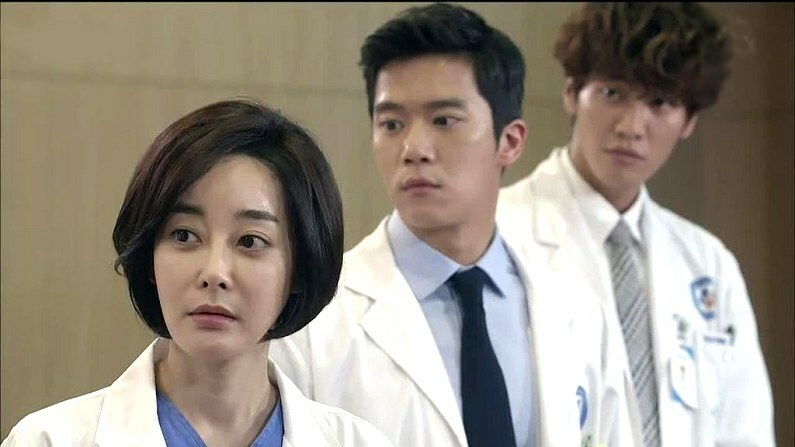 One of the lead surgeons at Mirae, Doctor Han Woo Jin (Ha Seok Jin from Shark), is unsure of the wisdom of accepting these patients and he butts heads with Hae Sung over their treatments. I wanted to claw this character's eyes out, he was so mean! Spunky Ddol Mi pipes up that she used to respect Dr. Han because in the past he had saved her life, but not anymore because of his lack of empathy for the patients with no money. It's not for quite some time that a humanization process changes Dr. Han's outlook, mostly due to an encroaching illness that will negatively affect his own life, and he eventually even comes to a point where he will fight against Director Park over what he feels is the right thing to do during certain medical crisis that develop, like a lack of supplies due to the inability of the outside world to bring needed assistance, or who should be turned away from their doors in future. Ddol Mi's stubborn personality causes friction with An Dae Gil (Lee Seung Yeol from High School - Love On), a spoiled young doctor who cares more about himself than others. Dae Gil entered the medical field to become a plastic surgeon and is put-off by the harsh realities of a disaster-torn city. And everyone dislikes the chubby Yoo Myung Hun (Ko Kyul Pil) who is lazy and always tries to wiggle out of doing any kind of surgery he considers beneath him ... which practically means EVERY surgery. Thankfully we have other doctors and nurses to admire, like Dr. Kang Joo Ran (Kim Hye Eun) who is married to a politician who struggles to help the city, Goo Ja Hyuk (Cha In Pyo, who played the president of South Korea in the 2013 disaster film The Flu, with Jang Hyuk and Soo Ae). Although their own son was injured in the earthquake they have to tear themselves away from his side in order to help other people. There's also the daughter of the narcissist director Park, Park Ji Na (Yoon Joo Hee) who harbors not so secret romantic feelings for Dr. Han. She is very dedicated but her father ignores her and insults her. One of the main sweetie-pies is nurse Kim Hyun Sook (Kim Jae Hwa) who is boldly dedicated to helping everyone she can. Even when she tries to think of herself for a moment it doesn't quite work, she is right back at her healing arts in full force. 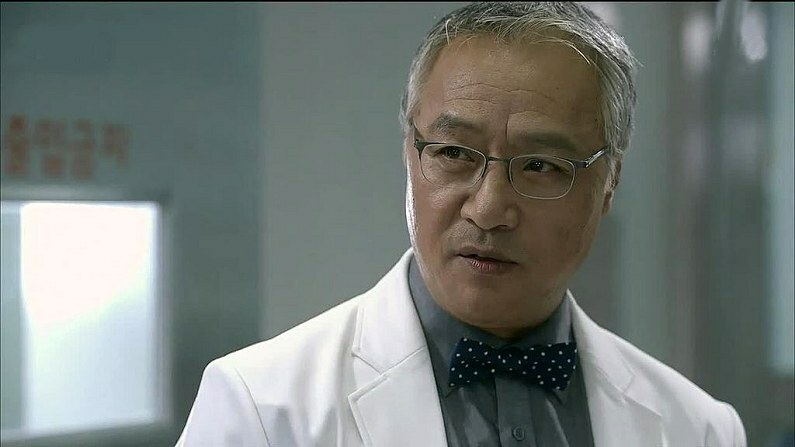 One of the best and most admirable characters is fire and rescue chief Choi Il Sub (Kim Sang Ho from Doctor Stranger) who struggles around the clock without sleep to save people trapped under buildings, even to the point it where his own daughter loses a leg because he can't be home to safeguard her alone. He rescues everyone he can, like a father and little son with cystic fibrosis, whom Dr. Lee eventually operates on, but the child dies, infuriating Director Park who demands Dr. Lee leave his hospital at once -- and take his comatose mother with him! I wouldn't be a bit surprised if actor Kim Sang Ho wins acting awards for his performance here in D-Day). He works with Dr. Lee's younger brother and in the process the boy finally matures and sees events more from his older brother's point of view. Then tragedy strikes ... will Dr. Lee ever be able to recover? Will he and Ddol Mi ever learn to love one another, when they both live such stressful lives helping others, that there's little time left over for themselves? D-Day's action sequences and special effects are worthy of a blockbuster film. The two things I would have changed if I were the scriptwriter:1) they gave too much time and attention to the narcissist bully Director Park. He had no business being in the medical field, he had no heart for patients, and 2) I would have definitely shown more of an effort from the international community to come to the rescue of South Koreans in Seoul. In real life if Seoul suffered an earthquake of this magnitude there would have been an international aid effort organized immediately to come to their rescue. A crippled Seoul makes it easy for the North to shake them even further with possible missile launches to attack the country. It was almost to the point of irresponsibility of the scriptwriter not to show some effort like that occurring to help the people. In the drama they were all by their little lonesomes trying to survive. In real life you'd have an immediately military presence from both the US and Korean soldiers to maintain calm after the disaster. For these two things I have to knock some points off this drama. I was engrossed in it while watching it because I loved the characters -- I just wanted to see more help come to them from the outside.